Artists from across the United States are invited to submit their ambitious installation ideas by February 19 for the chance to pitch them during the 2018 iteration of SXSW Interactive and ultimately to realize them at the world’s largest public art event this fall. GRAND RAPIDS (Michigan) FEBRUARY 5, 2018 - ArtPrize, the independently organized art competition recognized as the world’s largest annual public art event, in partnership with SXSW, will award a $15,000 grant to an artist or artist collaborative during SXSW Interactive. Five artists from across the United States will pitch their ambitious, large-scale installation ideas at a public event held at Michigan House Austin on March 12. The winner will use the funds to realize their idea at ArtPrize 10, where they will be in the running for a combination of public vote and juried awards totaling $500,000. Submissions for this “$15k ArtPrize Artist Challenge at SXSW Interactive” are now open. ArtPrize 10 is slated to return to Grand Rapids, Michigan from September 19-October 7, 2018. Artists from across the United States are invited to submit their installation ideas through February 19 at 5 p.m. ET. Following this open call, five finalists will be selected and flown to Austin during SXSW Interactive to pitch their ideas at Michigan House – a roving pop-up space where Michigan’s most dynamic companies, organizations, artists and entrepreneurs tell their stories under one roof. On the evening of March 12, the five finalists will have five minutes each to make their case in front of a live audience and a panel of art experts. 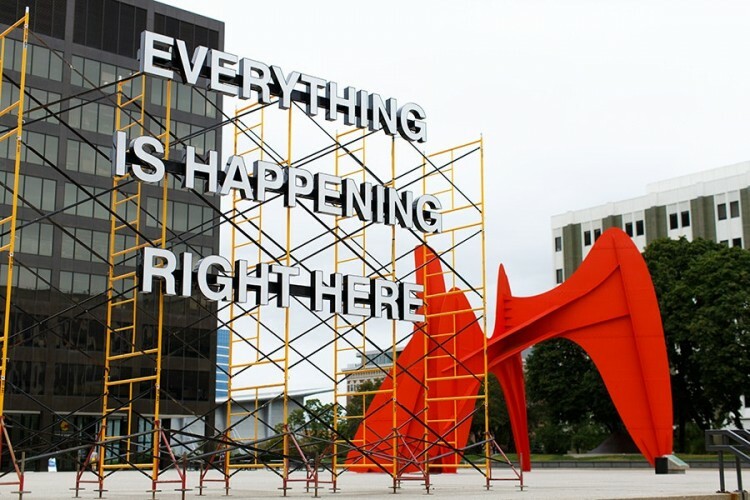 The winner will receive a $15,000 grant to install their project on Vandenberg (Calder) Plaza, alongside Alexander Calder’s iconic La Grand Vitesse, during the tenth annual ArtPrize event. This official SXSW Interactive event is modeled on the successful ArtPrize Pitch Night event series, launched in 2013 as a means of discovering and supporting exciting projects, and to reduce the barriers to bringing them to the annual competition. The “$15k ArtPrize Artist Challenge at SXSW Interactive” is part of a suite of ArtPrize granting programs that in 2017 awarded nearly $300,000 to artists, venues and educators to support their participation in the annual event. ArtPrize will return to downtown Grand Rapids, Michigan from September 19-October 7, 2018. Venue registration for the tenth annual event will be open March 5-April 5, and artist registration from April 16-June 7.